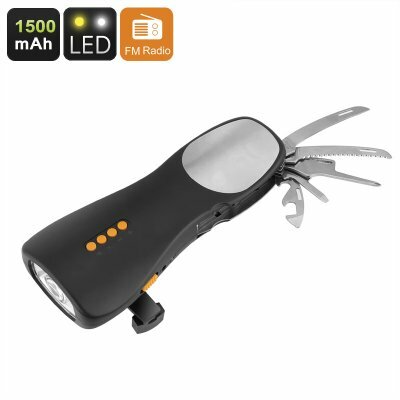 Successfully Added 9 In 1 Emergency Outdoor Tool - 1500mAh, Power Bank Feature, Tool Set, FM Radio, LED Flashlight, Hand Press Charger, Alarm Mode to your Shopping Cart. Stay safe while heading out in the wild with this 9 in 1 multifunctional emergency tool. Coming with an abundance of useful tools and features this multi-tool is the perfect companion to have at hand at all time. Not only does it feature the regular tools that can be found in a Swiss Army knife, it also holds a built-in radio, alarm function, power bank, LED flashlight, and a whole lot more. Packing a 1500mAh battery this emergency tool can be used as a power bank, ensuring that from now on you will never run out of juice again. Featuring a hand press, the battery of this multi-tool can be manually recharged meaning that with this tool at hand it is virtually impossible to run out of power to charge your electronic devices. Additionally, this survival tool also features a bright LED flashlight that, on a full battery, provides up to 10 hours of light. From now on you can leave your home after dark with confidence as with this tool at hand you can be assured you’ll never be stuck in the dark. Featuring a built-in speaker and FM radio this multifunctional emergency tool allows you to listen to your favorite tracks, talk programs, the news, and more even when you’re enjoying the wild outdoors along with all beauty Mother Nature has to offer. The tool will automatically save the last radio frequency you have used ensuring that there will be no need to search for your favorite channel every time you turn on the radio. With its battery that is rechargeable both electronically and manually you can be assured that, with this tool at hand, you’ll always have enough juice to listen your favorite tracks no matter where you are. Coming with 5 Swiss Army knife style tools this emergency tool features a pocket knife, saw, screwdriver, flathead screwdriver, and a can opener – providing you with all tools necessary to conveniently survive the outdoors or to fix emergency repairs at home or in the office. When equipped, the iron tools can additionally work as an antenna for your FM radio, significantly increasing your reach and radio. With the abundance of features this emergency tool packs you can confidentially head out into the wild. Additionally, this multi-tool is the perfect gadget to add to your car emergency kit or to simply have at hand at home, in the office, or during camping trips. This Emergency Tool Kit comes with a 12 months warranty, brought to you by the leader in outdoor gadgets as well as wholesale electronic gadgets..